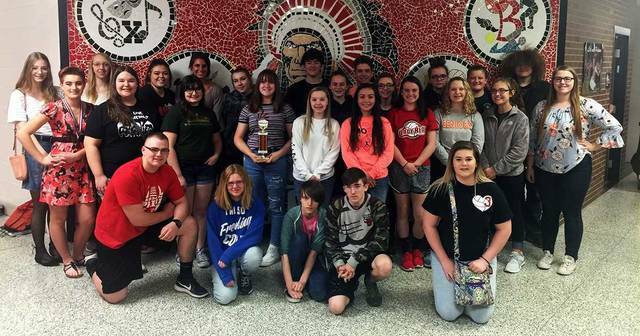 BUCYRUS — Artwork prepared by students from the Bucyrus Secondary School and Bucyrus Elementary School were selected as the overall winner in each building’s respective category during the annual Artapalooza art show at Mid-Ohio Educational Service Center (MOESC) April 10-13. The schools were selected from a field of sixteen other schools as the Best of Show by a panel of judges who critiqued the high schools, middle schools and elementary schools separately. The judge’s focus for this award was to select the best schools that demonstrated the best work as a collective. Several Secondary School students received individual honors for their artwork. Shaina Oreweiler (senior), Daniell Predieri (senior), and Alexis Adams (sophomore) all earned medals. Other Secondary School students whose artwork was on display included: Alexis Adams, Emmelia Bloomfield, Kelsey Carver, Samee Chase, Weston Davis, Kenzie Dye, Haley Easterday, Anthony Frizzel, Micah Graves, Justus Hargis, McKayla Hedrick, Clara Hinklin, Christina Johnson, Lillith Keller, Shelbee Lynn, Shaina Orewiler, Daniell Predieri, Natalee Predieri, Collin Remmel, Jaylon Rupe, Hallie Russell, Kael Scott, Hayli Stoffer, Mallory Studor, Chelsie Taylor, Kylee Tighe, Jade Torres, Kaitlyn Wells and Kiana Zehner, Addison Ricker, Laila Perdue, Evelyn Skidmore, Lexi Smith, Natalie Hankins, Chris Neale, Kendra Blizzard, Khloe Murrell, Jalyn Lyons, Brady Rankins, Samantha Farrar, Karmyn Blizzard, Dillion Downing, Kelsey Fackler, Alexxus Fannin, Kailey Horsley, Grady Jackson, Sarah Snodgrass, Blayze Eldridge, Amber Ransom, Jalynn Diller, Katie Kuhn, Mycala Lange. Angle, Nevaeh Lingo, Josie Stauffer, Jackson Kendall; (2nd Grade) Wyatt Makeever, Savannah Clark, Lucas Bradwell, Victoria Stang, Maddison Perry, Elyza Anderson; (3rd Grade) Gracie Quaintance, Mya Rothaar, Grace Bolles, Haliegh Pifer, Reese Garvin, Aubrie Kimmel, Shyheim Choate, Hadleigh James, Lilian Englehorn, Creighton Shirkey, Kyle O’Connell, Bryley Bryden, Braylon Murphy, Jazzlyn Jarvis, Xavin Hale, Elijah Williams, Dayla Sandlin; (4th Grade) Bailey Howell, Alexis Farnwalt, Macy Dyer, Dylan Coppler, Haylee Stratton, Emma Clark, Dixie Massey, Adalyn Zornes, Mackenzie Booth, Ayanna Jeffrey, Emma Graves, Layla Swerlein, Autymn Robson; (5th Grade) Eisley Graham, Jada Dalton, Cayley Bryden, Jayda Pickens, Owen Cox, Kaylee Mason, Baily Douglas, Olivia Hardy, Danica Rowalt, Isabella Stang, David Blankenship, Haydn Corl, Wayla Sutton, Trinity Mckinney, Ariahna Banks, Daniel Cambell, Aziana Jefferson, Zoey Hoskins, Marissa Middleton, Grace Jackson.